This White Hot Chocolate Bundt cake is dense, buttery and loaded with white hot chocolate. This easy cake is a winner with my friends and family. Pound cake is by far my most favorite cake to make. I have a standard recipe that I use and it is easy enough to modify. I love to eat it as is, add toppings such as fruit or whipped cream. I have also been known to eat it for breakfast. 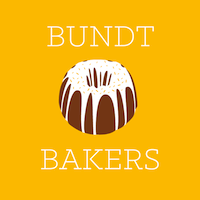 This months Bundtbakers is all about Hot Chocolate. So why not combine my love of pound cake and white hot chocolate? We love Hot Chocolate but never thought about putting it in a bundt until now. This idea and this months host is no other than Tara Noland from Noshing with the Nolands. In a stand mixer fitted with a paddle attachment cream butter and cream cheese together. Add sugar and mix another two minutes. Add eggs one at a time and then vanilla. Add the dry ingredients to the wet ingredients until incorporated. Fold in white chocolate chips. Pour batter into prepared bundt pan and bake for 1 hour or until toothpick inserted in the center of the cake comes out clean. Remove from the pan and dust with confectionery sugar. There are a few other bundts made with Hot Chocolate done by a few of my blogger friends. I hope this inspires you to bake a bundt with hot chocolate. Vonnie ,your cake is great. I would love you to stop by Food on Friday: Cakes over at Carole’s Chatter to add this to the cake collection! Cheers! I love the design of your bundt, Veronica. It’s absolutely beautiful with the powdered sugar on top. It looks a bit like a church after the first snow. gorgeous! I like the white chocolate idea!